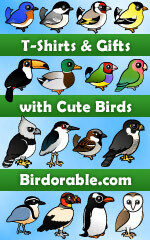 Home > Birding Apparel & Gifts > T-Shirts & Gift Ideas for Birders > Prop. of Ornithology Dept. This Property of Ornithology Department collegiate-style logo is a great design for any ornithologist or future ornithologist. Ornithology is the study of birds. These great ornithology t-shirts and novelties make great gifts for ornithologists, ornithology students, or anyone with an interest in bird life!